Madrid has a delicious secret for you! Our Madrid chocolate-lovers guide provides an explanation of the city's delicious delicacies worshipped by all sweet lovers and of course, where to find them. Join us on our 1.5-hour tour to discover the places in Madrid where you can enjoy sweets for chocolate lovers, along with our expert culinary guide. 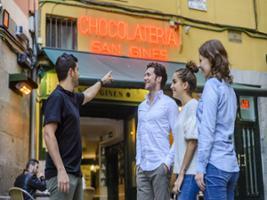 Savour the chocolate and churros at Chocolatería San Ginés, as well as typical Spanish chocolate delights, accompanied by Madrid's famous Madroño liquor. Have fun and feel unique in your experience in a Premium Small Group tour, delight yourself with our farewell. Although Spain is best known for its wine and its amazing ham, there are many Spanish sweets that will enable all the chocolate lovers to get their daily dose. Whether you are looking for a good cup of chocolate, a chocolate delicacy from one of Madrid's incredible chocolate shops or something to calm your cravings. On this 1.5-hour tour, our culinary expert guide will tell you that this stop is a must! I repeat – you must try this place and you have no excuses. San Ginés is the city's most famous chocolate café. This chocolate shop, dating from 1894, is always packed, thanks to our "Exclusive chocolate con churros & Cava Tasting Experience". The thick, sweet and delicious chocolate and churros awaits us on our arrival. "Churros are a long thin fried dough that is crisp on the outside and fluffy on the inside. They are usually eaten as breakfast or as a snack (between meals). Served with a mug of thick hot chocolate. 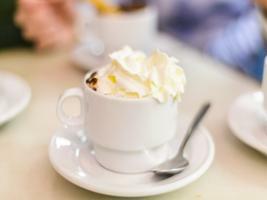 This is not to be confused with hot drinking chocolate, as this hot chocolate is thick and looks more like a pudding that can be eaten with a spoon. 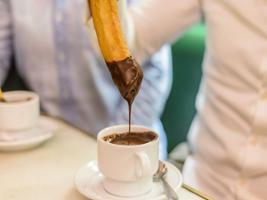 It is also recommended to drink it once you all your churros have been dipped and eaten. Continuing with our experience for chocolate lovers, you will savour an exquisite tasting session, trying Spanish chocolate delicacies accompanied by Madrid's exclusive Madroño liquor. You will visit a long-standing family store, with more than 3 centuries of experience, considered the birthplace of turrón (Spanish nougat) and stone-ground chocolate. There are classics like chocolate with hazelnuts, almonds, honey, cocoa, all of which are top quality, mixed together under the watchful eye of master craftsmen, holding the recipe for these delicacies for three centuries. A true luxury that will leave a delectable taste your memory. Have fun and feel unique in your experience in a Premium Small Group tour, delight yourself with our farewell.